Cats like to scratch. It's necessary for their claws and is instinctual. 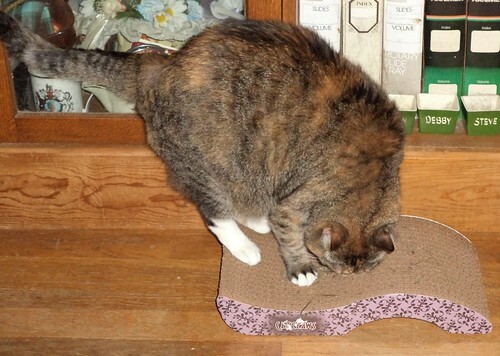 Providing them with scratching posts or boxes means, usually, they'll take their scratching to those surfaces instead of your couch, although, not always. I provide scratching boxes. The ones I got the gals around Christmas have seen better days. These are catnip infused which is attractive at first. 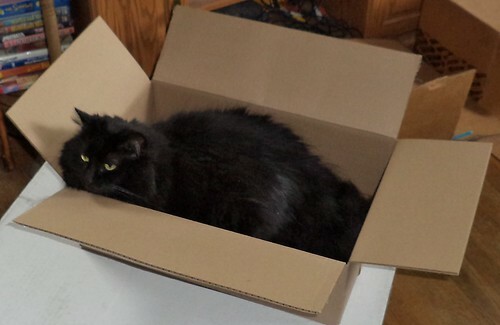 The corrugated cardboard is attractive to a cat and encourages them to scratch here and not on the back of the recliner. You can see where the most scratching is done. 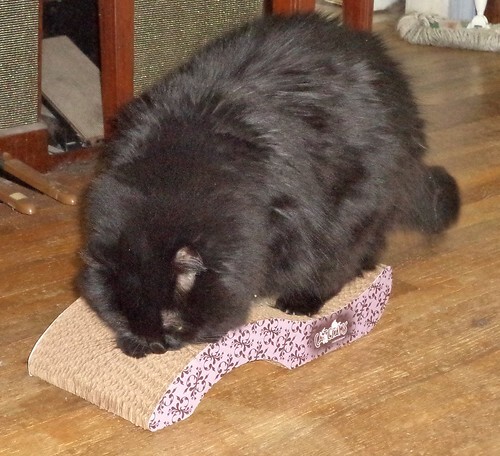 Every so often, I drop more catnip on them. Pilchard has been known to just lie on it. Here's Mija using this one. There was a bit of life left in them, but I needed new ones. So, I got new ones. I splurged just a bit and bought bigger pads. These are one and a half times as wide as the boxes. The curved shape should, in theory, enable to cat to use more of the surface area for scratching. said box has been as popular as the scratching pads. The company from whom I got the scratch pads sent along 4 small packages of Temptations cat treats. Oh yeah. Those are their favorite. 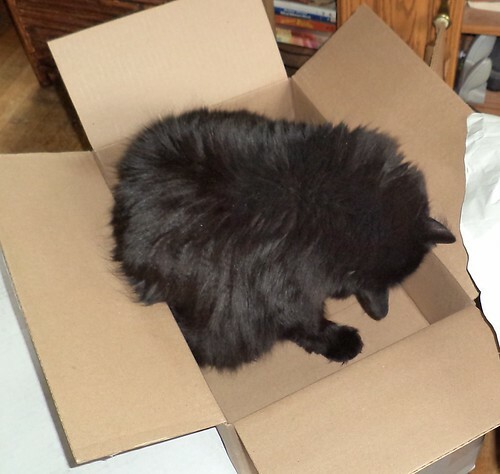 I didn't know the box was going to come with treats so that was extra special. On Saturday, I went to the local festival, Cream of Wheaton. 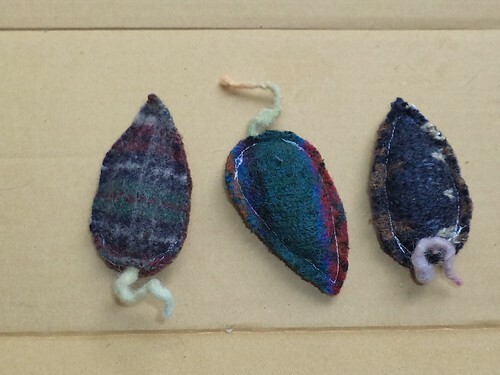 While walking about the arts and crafts vendors, I found one who was selling handmade catnip mice, 3 for $2.00. There's one for my girls and one for my grandkitty, Faux. These are made from wool, a heavy weight wool. They were a fantastic hit. Pilchard was in the scratching pad box when I got home so I just chucked one into the box. She wasn't sure about it at first but then she pounced on it like a pro. It's still in the box and both of them will attack it. For Mija, I dangled it just within paw reach. 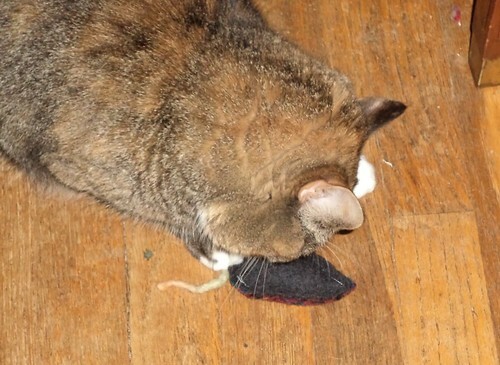 She swatted it hard enough to knock it out of my fingers and onto the floor. Then she proceeded to attack it in rigorous fashion, rubbing her face all over it. Ah yes. When I die, I'm coming back as a house cat. They live a really, really good life.